Observing sunlight and shadows, exploring layers of leaves and brush, imagining treasure maps and hidden cottages…all describe my childhood in the woods of Houston, Texas. I spent hours gathering and arranging sticks, feathers, and rocks among the trees. 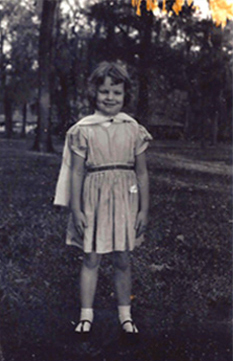 I was born in 1953 to a commercial realtor and a homemaker. I had one sibling–a sister, nearly 6 years older. I spent a lot of time alone in my yard, on my bike, and exploring the wooded acre behind our house. The biggest threats seemed to be the heat, mosquitoes, and the occasional copperhead that would find its way from the bayou into our yard. Behind our home was a Catholic seminary, with curious architecture and a mysterious sense of stillness. I longed to know what went on behind those brick walls. The priests-in-training would walk silently along the property line. I would crouch in the trees, waiting for one of those fascinating robed men to pass, which happened with some degree of regularity. I loved hosting birthday parties for my stuffed animals and rearranging furniture in my dollhouse. Doing most anything with my hands gave me pleasure and I always had a “project.” Additionally, I loved to read. One of my favorite books was a world atlas with large color photographs of distant places. My parents taught me two essential life lessons: the importance of service to others, and the necessity of getting out of one’s own small space to see the world. I went to college in North Carolina where I studied early childhood education. My first and only teaching job was in a rural elementary school next to a cotton field. My first graders came from homes with dirt floors and no indoor plumbing. Most had not attended kindergarten and had no experience with scissors, paste, and paint. I loved watching my students discover the joy of making a colorful masterpiece. I noticed that regardless of their challenges at home, many of these young children were incredibly creative. This was the beginning of my deep interest in creativity and wellness. In 1990 I enrolled in an art therapy graduate program at Pratt Institute in Brooklyn, New York. During this time I had many opportunities to witness the power of the creative process. Additionally, I studied the history of the healing arts and the research that demonstrates their worth. In 1997 I was hired to develop and facilitate a creative arts program at Children’s Hospital and Medical Center in Omaha, NE. I provided art experiences to patients facing a variety of life-altering health challenges. The children with whom I worked have had a significant impact on both my life and my art. Their wisdom and understanding about life was profound. Several years ago I made the decision to devote full-time attention to my art. I work in old boxes. I am fascinated by the way they look and feel, their scent and their histories. 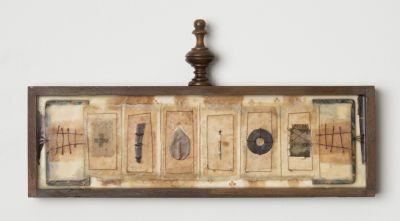 I use old paper, handmade books, maps, objects, and photographs–all poignant fragments of someone’s story. I incorporate encaustic, a mixture of beeswax and resin, into each piece. For me, art making is an intuitive process. I do not have a preconceived outcome in mind when I begin. 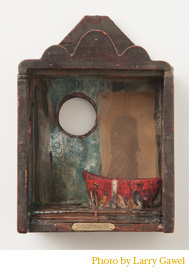 I start with an empty box, adding and removing objects and images, until I have a sense that they belong together. This process is repeated throughout the development and completion of each piece. The space within each box becomes a little world that the viewer is invited to enter and explore. I am intrigued by the metaphors of hidden places, layers, and openings. It is my hope that this work will inspire others to question and examine their own private worlds.